Curse of the Three Sisters(SeNMU) Review｜MANGA.CLUB｜Read Free Official Manga Online! Pretty good. Too short to give a strong impact. It was a cute and short read. I am not sure if they can continue it, but the art style was cute and the story itself was interesting. It is a good short horror story to read. The first manga I ever read. It was actually quite exciting! The art style was very interesting as well. I enjoyed it. Nice short horrific story. The drawings are really good and stylish, the parsimonious use of colors is great. Best thriller manga I've ever read! Really spooky ending though, I hope she gets her children back that is if they weren't always the three sisters. I loved the art style, it was very adorable. The plot is really good and I highly recommend to anyone who loves thriller and horror. Cute and creepy! My 2 favorite things! Short but really good. A really well thought out story, has classic character archetypes, the art is very cute for a horror, which helped the gore factor be a bit less grotesque if gore isn't your thing. Excellent twist ending that I didn't see coming until it started to unfold, definitely a nice change! Well is not bad, no much gore but the story is spooky. I really like to imagine the voices and music behind of each page. 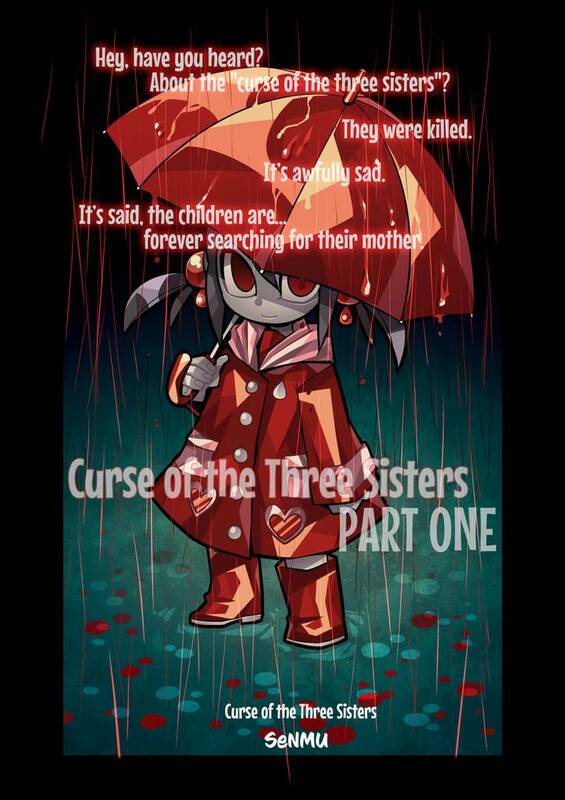 I thoroughly enjoyed reading Curse of the Three Sisters with it's combination of adorable art style and gore. SeNMU does a good job developing the plot with an interesting ending. I would recommend this to anyone looking for a short read or something similar to Corpse party but not as gory. What an interesting way of writing a horror story. The drawings might be simple, but they're definitely loaded with gore, which makes the story absolutely creepy. I like the concept. It's be good to write or animate a longer adaptation. Well that was fantastically creepy. I dig the fun art style, but I have to say that the use of color throughout this manga is probably the best I've ever seen. Really -- it's aesthetically amazing. Even if spooky kawaii isn't your thing, I still recommend it for the fantastic composition. Hehe. Those sister change from red to yellow. They are cute, so she shouldn't be afraid of. It's cute and creepy, i loved it. Pretty interesting read, it's a story of an urban legend surrounding three sisters who haunt an abandoned apartment and four other girls investigate the apartment room as a test of courage. I will warn readers that there's some graphic gore involved; in case you're not comfortable seeing young girls in this kind of situation but overall, it's a fairly good horror story and ends in a decently written conclusive manner that suits this kind of genre. I thought the art style was cute. The story started out interesting. But after the main characters visited the abandoned apartment, the plot went downhill. The suspense was gone, and the story became predictable. I didn't find the scares to be terrifying since I saw them coming. The cute stylized artwork was the manga's strongest point. Each character had a distinct look that made it easy to tell who is who. If you're looking for scares, you will not find it in this manga. But, if you like looking at awesome stylized art, then this manga is it. This is great so far. I've only read the first book, but I really like it, very spooky.